So blessed to have caught this moment in time! It’s Friday, so time for my weekly Friday post which reminds me of how lucky I am to be alive in this world. I hope it encourages you to feel the same way, even if you’ve had a tough week. I helped a foreign student in person last year at my job, and again helped her over email this year. I didn’t think much of it; after all, it’s part of my job to be helpful. But it must have meant a great deal to her because she sent me a very nice box of Belgian chocolates, from Belgium!! The chocolate lover in me (and in all of my colleagues) was very happy to receive such a lovely, unexpected gift.I guess, if you ever wonder if you can make a small difference with individual actions, well, there’s your answer. You can. I talked “live” with someone on the phone tonight who I met online and it was awesome! So in line with this person, it’s amazing, the power of the Internet! A lot of you have heard about the actor, Paul Walker, and his surprising demise earlier this week. He was only 40. That’s a year younger than me. Makes you thankful for what you have, and being alive. The battery on my bike appears to be having issues this week. I’m glad that I can have such first-world problems. Not everyone in this world even owns a bike, let alone an electric one. 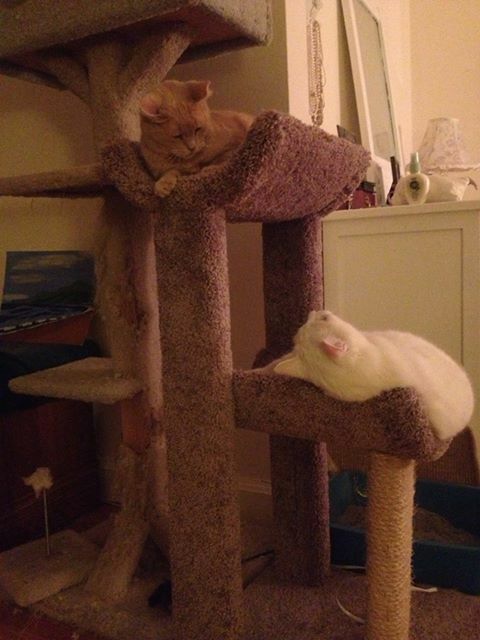 The cat tree that I bought for my animals this week, seems to be a hit. Money well spent if it makes them happy. My mom and I decided to not exchange gifts this year for Christmas. There comes a time when you just realize it doesn’t make sense to exchange gift cards or such. It is more about the spirit of the holiday than the actual gifts, anyway. I will be picking up my Xmas decorations from my brother’s house this coming week (they store them for me in their attic.) I love how cozy having a lighted christmas tree can make a home feel. A few days went by this week where I realized I hadn’t thought about my ex. That’s a really good sign. I also realized that when I did think of him, that pang of sadness wasn’t there anymore. Not like when I deleted his information out of my phone just a few weeks ago. And the more I think about it, our views were diverging more and more, so it wouldn’t have worked out long term. I realize that now. I came across this video this morning (see it embedded below), and also a friend sent me this link. I hope they both make you smile! What are you thankful for this week? Please drop me a line below and let me know! ← What makes us do this? I am thankful – for getting connected with like minded people, for finding my tribe. For the strength and encouragement I received from them. I value their opinion and get inspired to write more and polish my writing. Very glad to be a member of your tribe, Grace!!! Definitely keep writing, I enjoy all of your posts.